Built over 2 years to meet the traffic filtering needs of the most demanding buying platforms, trading desks, exchanges and verification companies. Detects invalid banner, video and in-app traffic on both mobile and desktop. Leverages a proven method widely used in finance, intelligence and physics. Available on permissive Apache license and guaranteed to remain 100% free. Easy to deploy docker containers for a scalable fully featured pre-bid solution. Detects display, video and in-app based ad fraud, web scraping and other forms of invalid traffic from both mobile and desktop sources. Entropy measurement is one of the most widely used methods for detecting anomalies in large datasets with many unknowns across a wide range of problems. 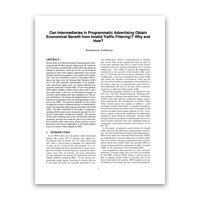 Highly optimized C++ codes run on minimal computing resource and scale to meet the needs of even the largest advertising technology companies. Pre-bid filtering of 300,000 QPS traffic stream have the total-cost-of-operation of less than $5,000 per month with below 50ms decision delay. The permissive apache license allows reuse, modification, and reselling to meet the needs of all advertising technology companies. Built in close collaboration between the most experienced ad fraud experts, leading adtech innovators, and highly regarded academic researchers.